'Keep The Faith In Our Country And Hold Fast,' Mattis Tells Defense Department Monday is the Defense Secretary's last day on the job. He urged people to "to support and defend the Constitution while protecting our way of life." 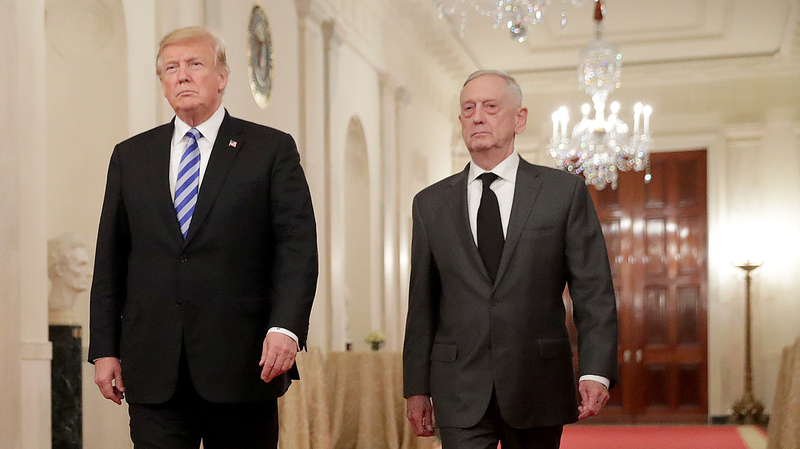 President Trump and Defense Secretary James Mattis at the White House in October. Mattis will be replaced by Deputy Defense Secretary Patrick Shanahan on Tuesday. Defense Secretary James Mattis released a farewell message to all employees on Monday, in the waning hours of his job as Pentagon chief. "I am confident that each of you remains undistracted from our sworn mission to support and defend the Constitution while protecting our way of life," he wrote. He said that the Pentagon is at its best "when the times are most difficult," and told them to "keep the faith in our country and hold fast, alongside our allies, aligned against our foes." The short note follows a longer resignation letter that Mattis penned shortly after President Trump announced the withdrawal of U.S. soldiers serving in Syria and reports that half of U.S. forces in Afghanistan would be leaving. Supporters of Trump's decision, like White House adviser Stephen Miller, told CNN it would end "an absolutely catastrophic foreign policy" that further destabilized the Middle East, and cost money and lives. But critics said such a move would ensure a resurgence of ISIS, and strengthen American adversaries like Iran, Russia and Syrian President Bashar al-Assad. They also said that pulling out could embolden Turkey to attack Kurdish forces in northeastern Syria, which Ankara considers to be terrorists. Mattis' resignation letter, dated Dec. 20, described his core belief that "we cannot protect our interests or serve that role effectively without maintaining strong alliances and showing respect to those allies." He said that countries like China and Russia "want to shape a world consistent with their authoritarian model," and "at the expense of their neighbors, America and our allies." His words were definitive and frank: "My views on treating allies with respect and also being clear-eyed about both malign actors and strategic competitors are strongly held and informed by over four decades of immersion in these issues," he said. The letter evidently upset President Trump. Mattis planned to leave his post on Feb. 28, saying it would allow adequate time for a successor to be nominated and make sure the Defense Department's interests were "properly articulated and protected" at upcoming Congressional hearings and a NATO meeting. Instead, the president hastened his departure. He picked Deputy Defense Secretary Patrick Shanahan to be acting Secretary and ordered Mattis to step down Dec. 31. Shanahan was a senior vice president at Boeing who spent more than three decades at the company. He has little military or government experience. During Shanahan's confirmation hearing to be deputy secretary in 2017, the late Sen. John McCain became livid. Shanahan had told the senator in written response to questions before the hearing that he would have to see whether the U.S. should supply Ukraine with weapons to fight pro-Russian separatists in the east of the country. It was an issue the committee had discussed extensively. "Have you not been aware of the thousands of people that have been killed by Vladimir Putin?" McCain asked him. "Have you missed all that in your duties at one of the major defense corporations of this country?" Shanahan later sent a 10-page letter to McCain, pledging his support for arming Ukraine. Soon thereafter, 92 Senators voted to confirm him. Foreign Policy Pentagon correspondent Lara Seligman told NPR that Shanahan will likely try to modernize the defense forces, and that Boeing received three multi-billion dollar contracts in the last six months. One is for an upgraded version of the F-15X fighter jet. "It seems a little strange that it's gaining traction, and it very much seems like the Pentagon leadership is forcing the Air Force to buy this plane even over the objections of their own people," Seligman said. Michele Flournoy, who was an Under Secretary of Defense for Policy during the Obama administration, told NPR that Mattis' exit — as well as Trump's method of drawing down military forces – was worrying. "Secretary Mattis brought a lot of ballast to the system," she said, "reassuring our allies and frankly doing a lot to reassure the men and women who serve in uniform." NPR National Security Correspondent David Welna contributed to this report.